Three words that best describe Andre are: Creative, Technical, Fluid. Andre’s comprehension of shapes, structure and creativity has taken him all over the United States. 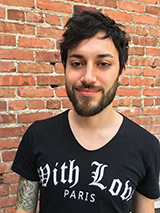 He has years of experience in the fashion industry and is a Paul Mitchell the school Pasadena, graduate (also apprenticed under Noogie Thai). He has worked as an instructor in Hawaii for Paul Mitchell’s prestigious hair academy in Honolulu, teaching master haircutting and color. He’s a certified Aveda and Paul Mitchell color and cutting hairdresser. He has done hair for LA Fashion week, MAXIM, OC Weekly, Wet Seal, OMG! magazine, INK’D magazine, Kougar mag, and many runway fashion shows. André is well known for his exceptional haircuts, ombrés, balayage and amazing wash house experiences. Hair should be an experience. Experience Aveda through the hands of an artist.